Closing the books on our 2nd annual SQL Saturday in Chicago, it's evident this one was a resounding success! Speakers - THANK YOU! Without the incredible knowledge you share and the sacrifice of your time, the community would not be as strong as it is. The selfless act of donating not only your time but your knowledge as well makes the SQL community a force to be reckoned with. Volunteers - THANK YOU! As much planning as the staff can manage ahead of time, it's those extra hands that make it all come together at the end, and the day-of the event. Without your sacrifice of time - which you could have spent attending a session - you manned a table, checked people in, handed out t-shirts, helped people find rooms, etc etc etc. Our gratitude goes out to you a hundred-fold. Venue - THANK YOU! A huge thanks to DeVry in Addison, IL. Your facility made our event first class education for our attendees. Having a technical facility for these kind of events really steps it up in a BIG way. We are very much looking forward to working with you again next year. Staff - I've already thanked the great staff assembled this year HERE and apparently did such a great job of making sure they were recognized, that people keep forgetting I was on the staff too! Having a larger number of people involved definitely made it easier. The whole 'divide and conquer' attitude worked very well and allowed people to delegate. Is there still room for improvement? Definitely! We already have more ideas for next year, so stay tuned. Okay, so when I originally wrote this, I had another particular group in mind to give a big THANK YOU to, and I can't believe I forgot! To the Spouses and Familes of everyone involved - THANK YOU! The time and dedication of so many people is invaluable and without your support it just wouldn't be possible. Everyone has a busy life at home and obligations to meet. Your contribution hasn't gone unnoticed and is very much appreciated! The biggest red mark for us was the evaluation process. I tried to model the prize giveaways after the Kansas City SQL Saturday method, but it fell flat. I believe moving the Chapters table (where the prizes were waiting for the winners) to a more central location would have helped that out significantly. Also, communicating to the speakers about how to handle the evals at the close of their sessions - I spoke to many of them, but it would have been nicer to have something at each podium as reminder. Alternatively, we could have had designated room monitors for each session. That's a lot of people, but something to consider for next time. Overall, the event was amazing! We had top-notch everything from Sponsors to Speakers to Attendees. My biggest surprise was how excited our out-of-town guests were to get Dunkin Donuts - I had no idea they didn't have those at home! I like to give the event a home town feel, as if we were inviting people into our home, I hope we were successful in that and we look forward to seeing you again. C'mon Back Next Time, y'all! As SQL Saturday Chicago comes screaming around the bend ready to cross the finish line, there are a lot of people you should know so when you see them at the event, you can thank them personally. Without their dedication to a successful (and fun!) day for everyone, Chicago would not be able to present this great resource to the community. Let me introduce them to you in case you weren't aware. Norman Kelm - the man with the connections and SQL Saturday Superman! Norman has been both the grease and the wheel this year and he deserves majority of the credit for bringing it all together with DeVry and all of our great sponsors! Ted Kreuger - not many can single-handedly tackle close to 150 submitted sessions and pull together a varied and top-notch schedule for a one day event. Bravo, Ted, and thanks again for wearing this hat! Bill Lescher - Bill, I'm going to thank you now because I know what's coming. Being in charge of Registration for such an event is a big job with little prep time. With help from my co-worker Rich Rousseau (who actually can't even be at the event and just welcomed a new addition to his family!) I know you will have everything going smoothly. Aaron Lowe - another of my fabulous co-workers, Aaron has been behind the scenes keeping things in check and making great recommendations. And, not officially on the staff, but always willing to step in and help out whenever needed, I'd like to thank Jes Borland for coming through with the t-shirts for us! Thanks for your ideas and your perseverance with helping us pull together something people will be much happier with this time around. There will be (and are) many more Thanks to come, but these people have really been hitting it hard here to make this happen and I hope you find time to thank them when you see them at SQL Saturday in Chicago in just two short weeks! 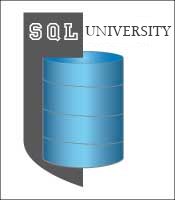 It's been a great week at SQL University once again! Several prominent women in the SQL community have shared with us their love of technology, thanked those who have inspired them or showed them an opportunity and expressed a desire to mentor their daughters and other young women in their lives. With such a great resource of posts, I hope you have found inspiration, perhaps even renewed your inspiration, for your own role in the WIT community. Man or woman, you can make a difference in a young person's life! My story isn't much different from others' - I had an opportunity to work with 'Basic' as a 7th grader (honestly, that didn't do it for me), and ended up working in PASCAL my Freshman year of High School (THAT was way cool!). However, it was my love of aeronautics which drove me to the Math and Science classes early on. Everything NASA and flight related made me smile and want to learn more. Alas, that path was not to be, but the inspiration laid a great foundation of research and logic methodologies. Of course, there were great mentors along the way even though I never realized it until much later. One of the most influential was Col. Massie at the Academy of Math & Science. As the head of our Air Force Junior ROTC unit, he was instrumental in assuring I applied to quality Universities and pushed me to pursue an Electrical Engineering degree. Those of you who know me also know that didn't pan out so well either, but again, the experience of sitting in classroom after classroom of highly intelligent people (and they were ALL guys) was very valuable. What I learned the most at that time was that I still had quite a lot to learn if I was to keep up (much less compete) with kids who had grown up programming since they were 12 or 13 years old. My experience was limited to a few special labs and short sessions a handful of times in school. I was seriously behind the curve and it was both devastating and demoralizing - I quit. I gave up. I failed. Fast forward several years, armed with a Bachelor of Science degree in Psychology, I was once again ready to tackle the world. After a few jobs here and there, my love for things technical was still evident. I ended up taking a job with a technical training company and met another of my mentors - a fellow trainer who specialized in Lotus but was also a fantastic VB programmer. He taught me a lot about teaching programming to others and introduced me to Object Oriented methodology. Thanks, Bruce! Now that I'm entrenched in a technical field and excited about what I do, I want to inspire others to find happiness in similar roles. Also, I want to inspire my kids to have a love of technology and science and math. Both of them: my daughter AND my son. Right now, my efforts are mostly limited to my own children and those of my friends. Plans in the future include working with either a local school group or maybe the Girls Scouts; I'm not really sure still. The important thing is to show young people that I'm in a career I enjoy, I make a pretty good salary and opportunities in my field are wide and varied. To wrap up this week of inspiration, I leave you with a final assignment (don't worry, it should be easy!) I challenge you to share your enthusiasm with a child or group of children. It doesn't matter if they are your own, or those of friends, or a group of strangers. See if you can reach out and spark an interest in someone else and then please SHARE that experience with the community. Write a blog, or post something to your FaceBook account, whatever you find easiest. Whether you feel like it or not, YOU are a role model to others. Use it well! It's March - that means spring is coming (or has already started depending on where you live) for North America and we're celebrating Women's History Month! March 7-11 SQL University hosts Women In Technology week. We have five amazing women posting throughout the week on WIT topics. March 15-16th It's 24 Hours of PASS Spring edition featuring all women speakers. Sign up for great training, all day long - FREE - at your desk! March 19th - SQL Saturday in Columbia, SC. Sandra Mueller host a WIT Panel and discussion. March 26th - SQL Saturday in Chicago. I'm hosting a WIT Panel and discussion! If you're interested in becoming involved in the WIT Virtual Chapter of PASS, please check out our website. Currently, we are just beginning the planning for our premier event, the WIT Luncheon at the PASS Summit. We also assist with WIT sessions at SQL Saturday events so there's plenty of opportunity to become involved. It's entirely possible that there are more events happening in our community this month, so please feel free to let me know and I'll be happy to add them to this list!